The Doberman Pinscher is a working breed that serves as a guard dog. 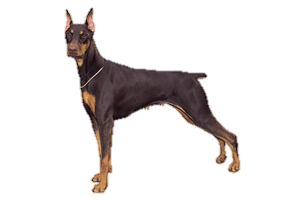 In many parts of the world this breed is known only as the Dobermann since “Pinscher” is the German word for terrier. The Doberman Pinscher was created in the 1870s by German tax collector Louis Dobermann in Apolda, Thuringia. He wanted a breed that could not only protect him, but would encourage debtors to pay up. Having a second job at the local animal shelter gave him access to a number of dogs for breeding. There are various breeds that were believed to have been used in its creation, however the German Pinscher, Rottweiler, Manchester Terrier, and Beauceron are the most likely candidates that were used. When Dobermann passed away in the late 1800s he left the bloodline in the care of Otto Goeller, who would then add Greyhound to the mixture. Is the Doberman Pinscher Right for You?